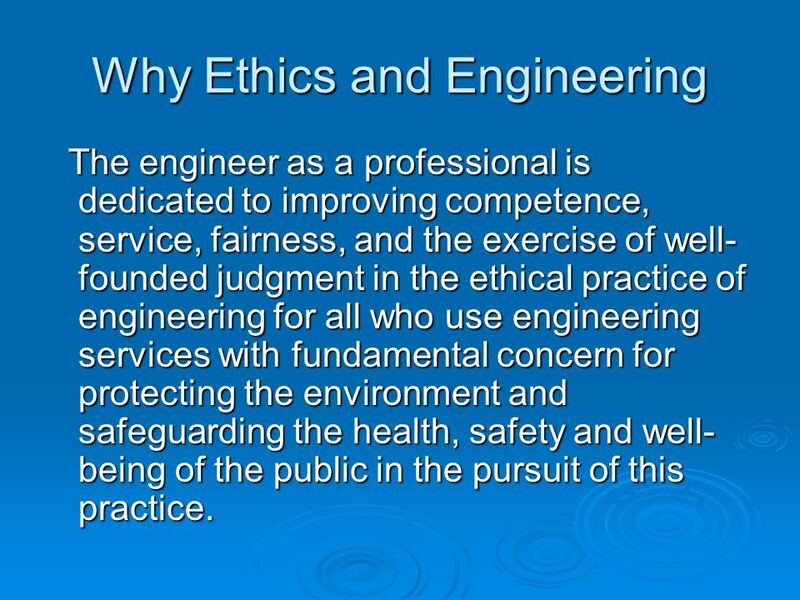 The engineer as a professional is dedicated to improving competence, service, fairness, and the exercise of well-founded judgment in the ethical practice of engineering for all who use engineering services with fundamental concern for protecting the environment and safeguarding the health, safety and well-being of the public in the pursuit of this practice. 5 Why should I study ethics? Adaptation for current business environment on corporate governance. Increased governmental legislation on industry. 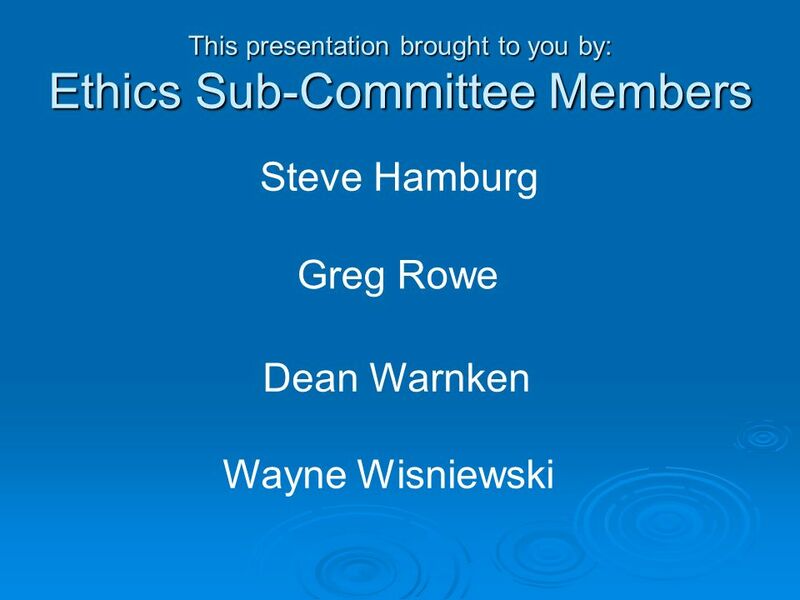 Fulfillment of chartering, registration, or certification requirements on Ethics training. Provide vehicle for required training for SPE members. 6 Better alignment with other professions (Attorneys, Accountants, Physicians) where public interest is involved. 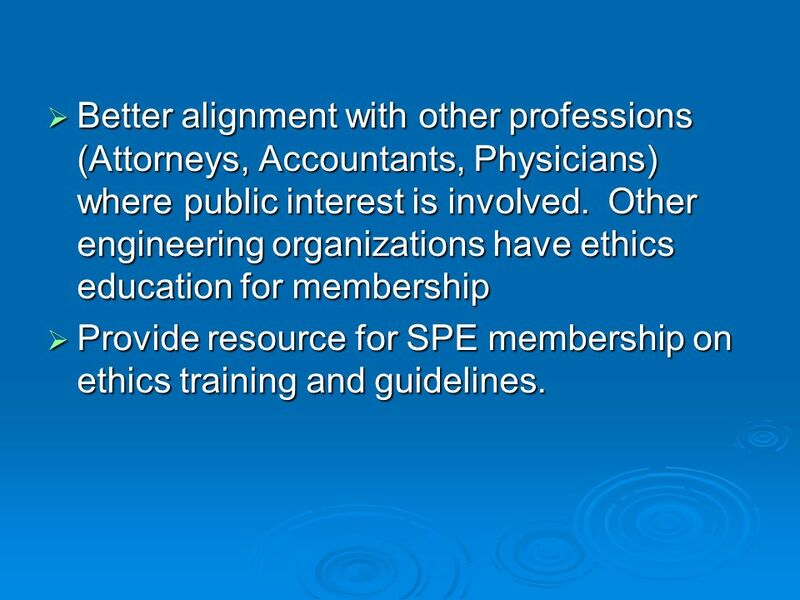 Other engineering organizations have ethics education for membership Provide resource for SPE membership on ethics training and guidelines. Ethics can be complex, without a clear answer. 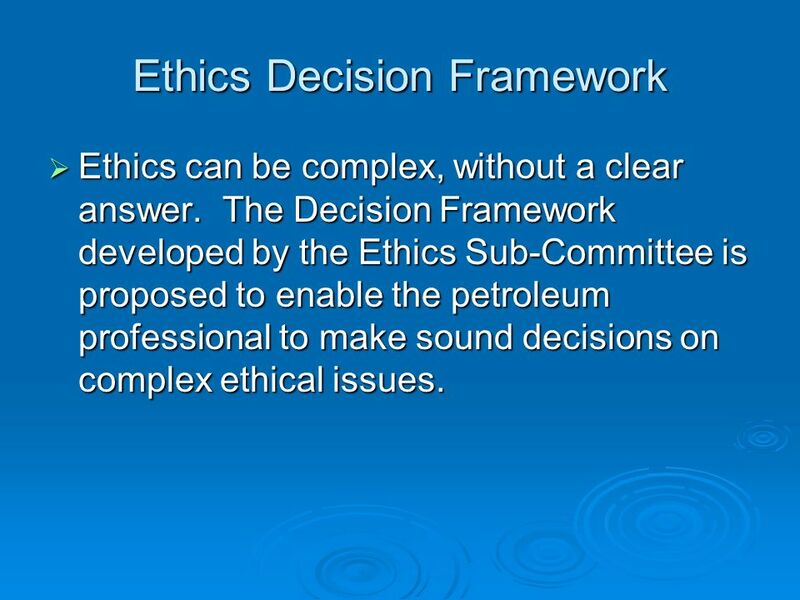 The Decision Framework developed by the Ethics Sub-Committee is proposed to enable the petroleum professional to make sound decisions on complex ethical issues. 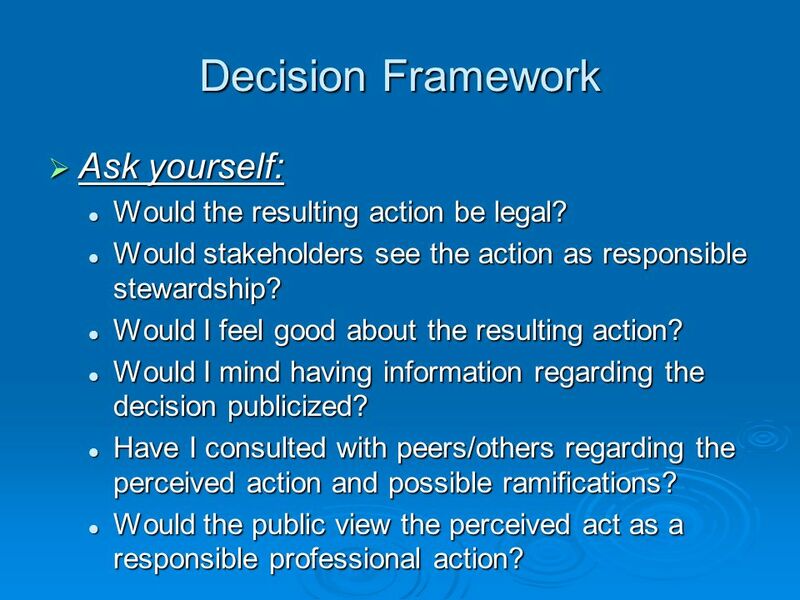 9 Decision Framework Ask yourself: Would the resulting action be legal? Would stakeholders see the action as responsible stewardship? Would I feel good about the resulting action? Would I mind having information regarding the decision publicized? Have I consulted with peers/others regarding the perceived action and possible ramifications? Would the public view the perceived act as a responsible professional action? I was told that I could hire a consultant to take care of getting all the permits we need from a foreign government. 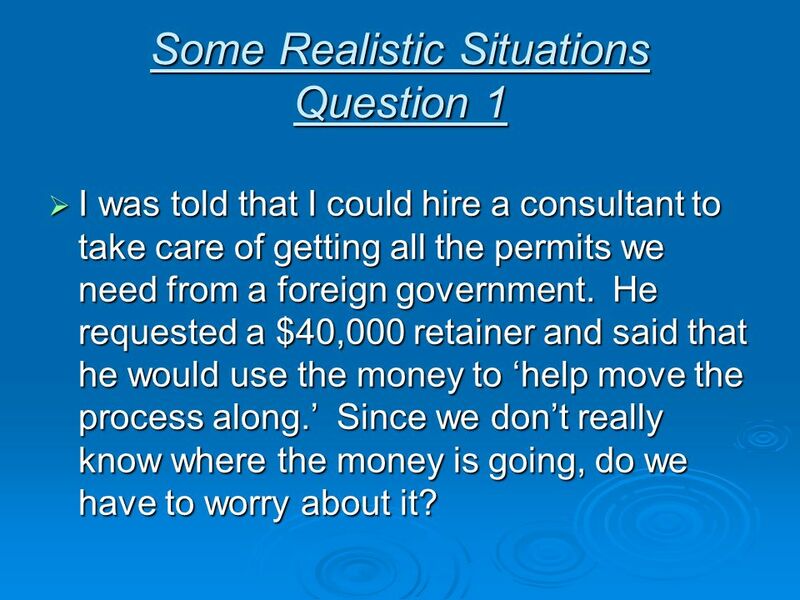 He requested a $40,000 retainer and said that he would use the money to ‘help move the process along.’ Since we don’t really know where the money is going, do we have to worry about it? Yes. You should know enough to find out if your consultant is getting an unfair advantage on the competition. Is it customary for conducting business in this foreign government or a one-time deal to get special favors? 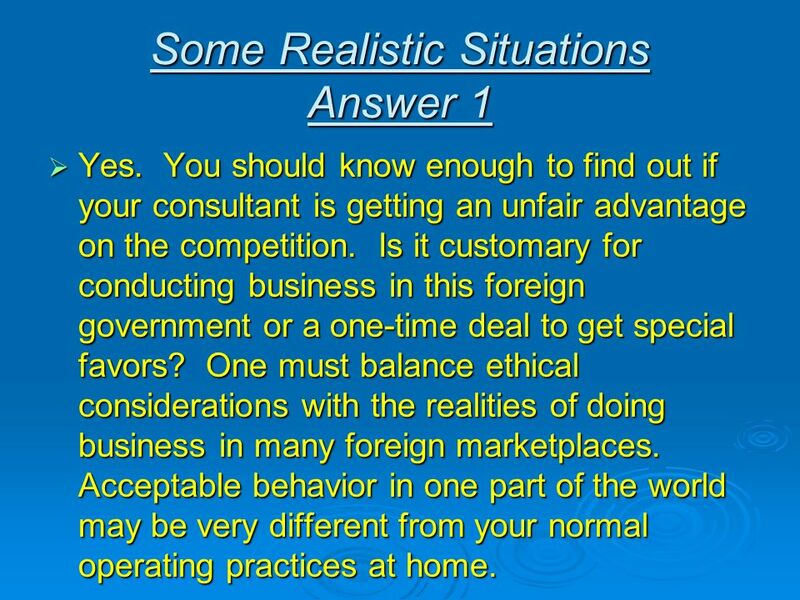 One must balance ethical considerations with the realities of doing business in many foreign marketplaces. Acceptable behavior in one part of the world may be very different from your normal operating practices at home. 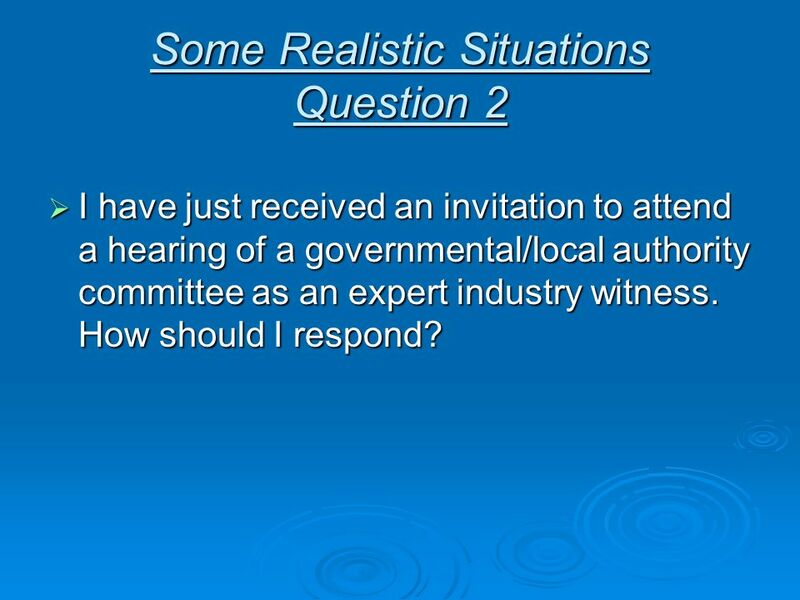 I have just received an invitation to attend a hearing of a governmental/local authority committee as an expert industry witness. How should I respond? 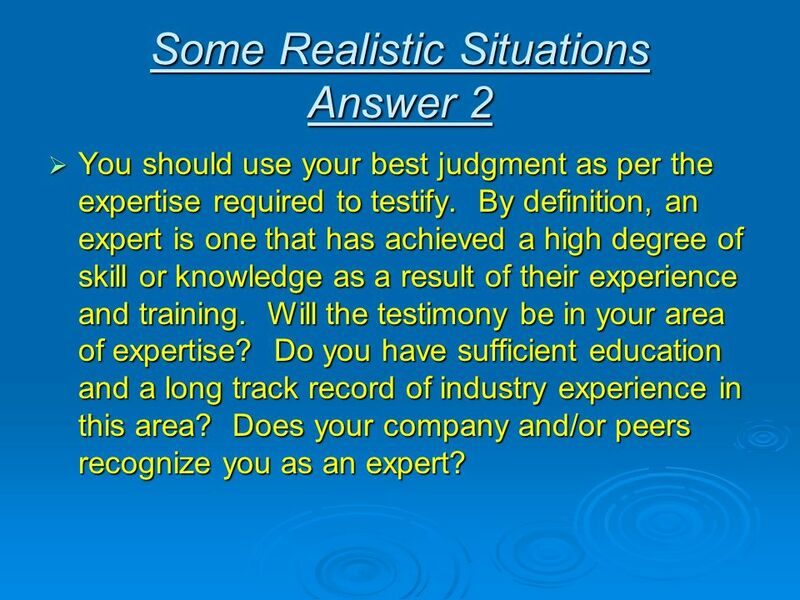 You should use your best judgment as per the expertise required to testify. By definition, an expert is one that has achieved a high degree of skill or knowledge as a result of their experience and training. Will the testimony be in your area of expertise? Do you have sufficient education and a long track record of industry experience in this area? Does your company and/or peers recognize you as an expert? It is the last week in the quarterly reporting period. My boss wants to make sure we meet our numbers for the quarter, so he asked me to record an unconfirmed sale now that won’t be finalized until next week. I guess this won’t hurt anyone – should I do what he says? You must make a judgment call. Is this a common practice or a first-time request? 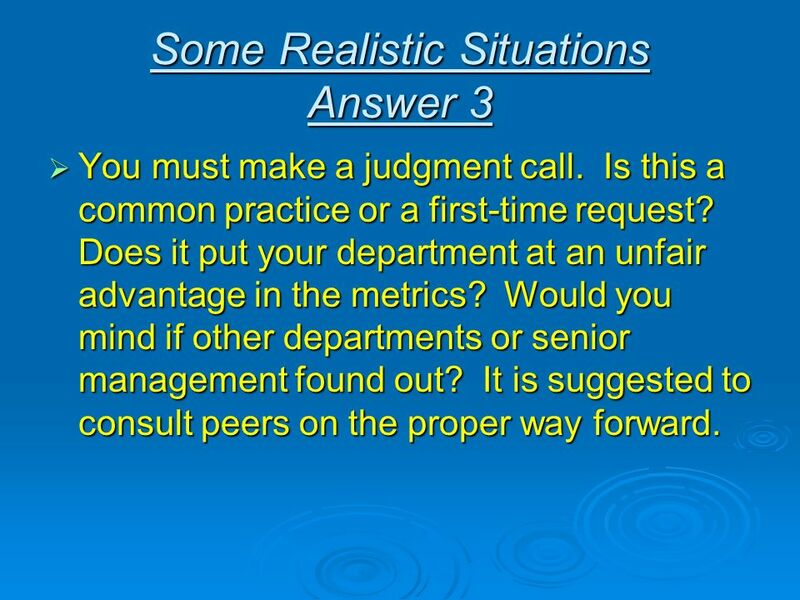 Does it put your department at an unfair advantage in the metrics? Would you mind if other departments or senior management found out? It is suggested to consult peers on the proper way forward. My team’s year-end results are ahead of budget. A piece of new non-material equipment is due to be purchased and delivered in early January of the new year. 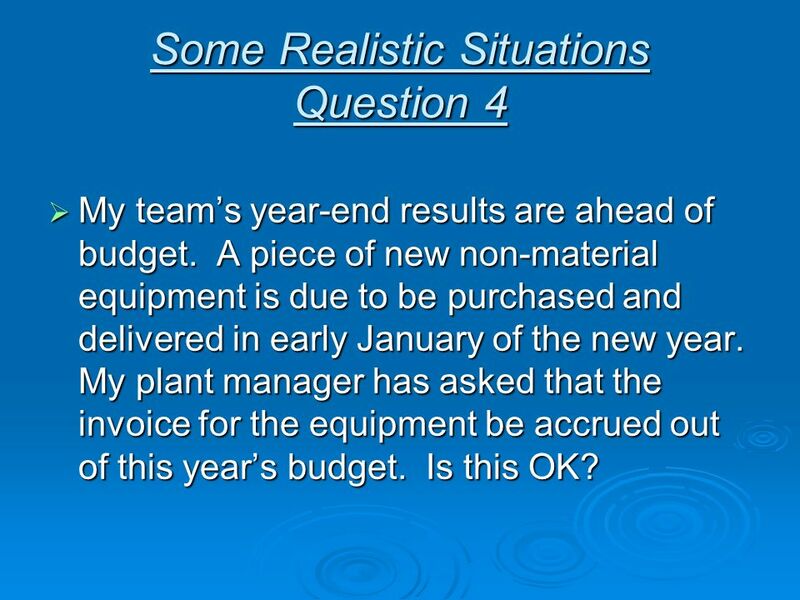 My plant manager has asked that the invoice for the equipment be accrued out of this year’s budget. Is this OK? Is this a common practice or a first-time request? Are you breaking any tax laws? Is this an illegal ploy or good, solid financial engineering? 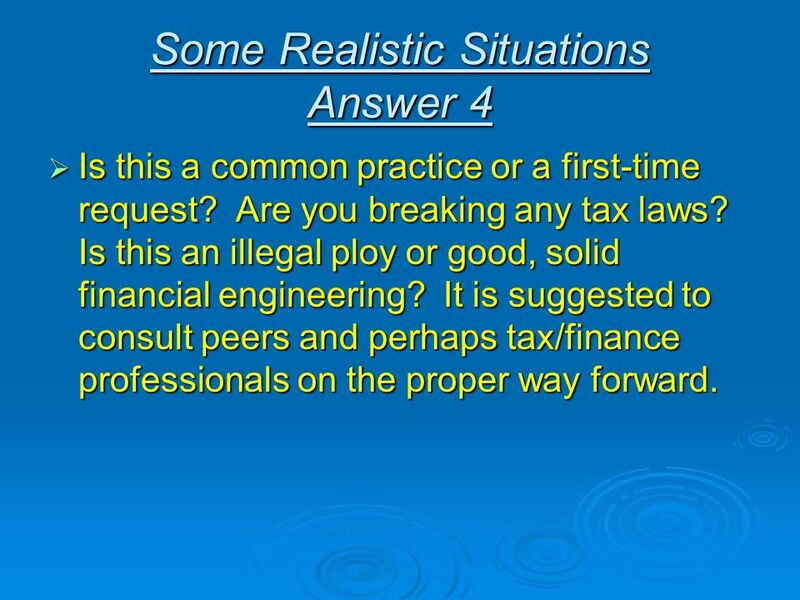 It is suggested to consult peers and perhaps tax/finance professionals on the proper way forward. 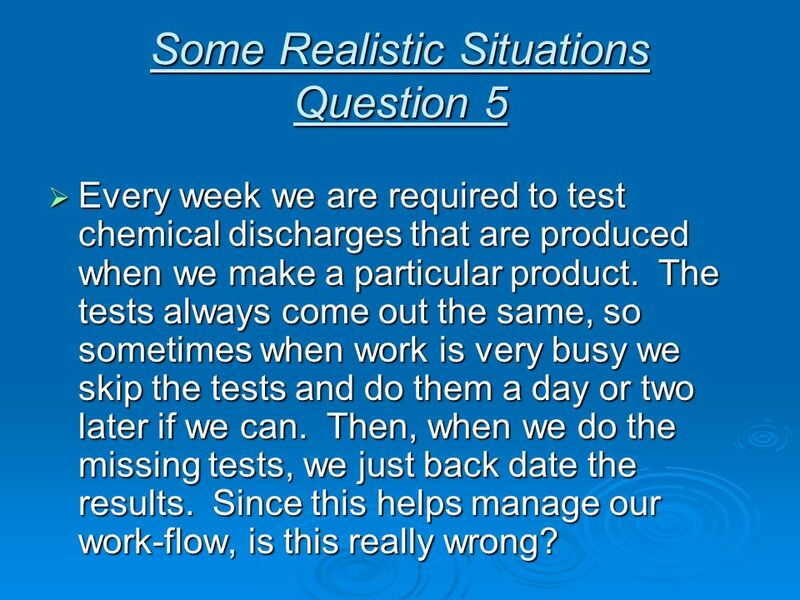 Every week we are required to test chemical discharges that are produced when we make a particular product. The tests always come out the same, so sometimes when work is very busy we skip the tests and do them a day or two later if we can. Then, when we do the missing tests, we just back date the results. Since this helps manage our work-flow, is this really wrong? Definitely wrong. Would you want to live next to a plant that followed this behavior? Probably not. 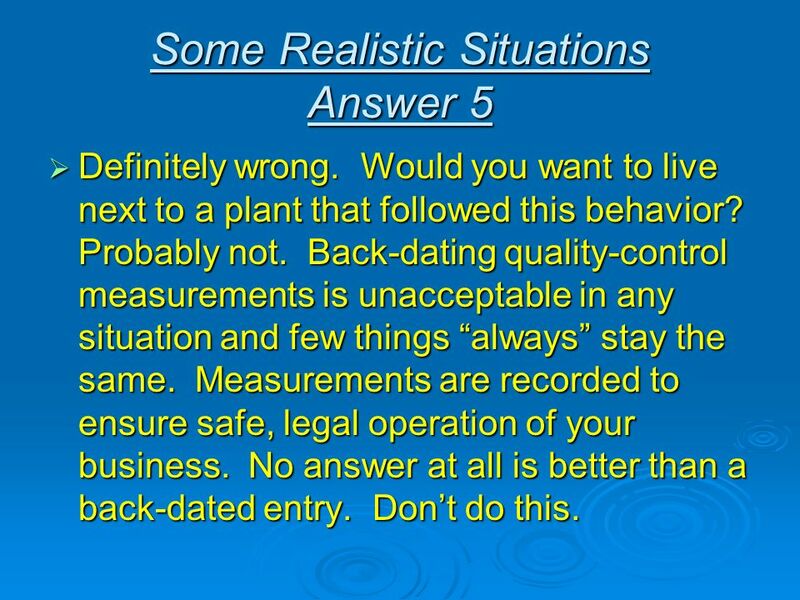 Back-dating quality-control measurements is unacceptable in any situation and few things “always” stay the same. Measurements are recorded to ensure safe, legal operation of your business. No answer at all is better than a back-dated entry. Don’t do this. The company just seconded me to be the controller of a new production JV company. I see competitors in the same marketplace transferring crude at less than market price to a subsidiary of one of the joint ventures for resale at market price to a third party. That can have the effect of reducing taxes for the joint venture and increasing profits for one joint venture. 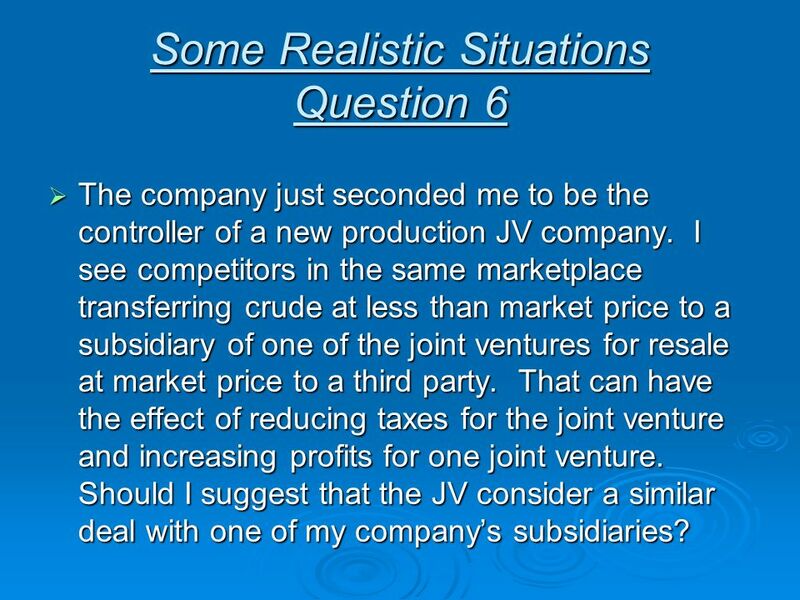 Should I suggest that the JV consider a similar deal with one of my company’s subsidiaries? You have a responsibility to do what is best for your company. Is this a legal loophole and/or acceptable practice in the jurisdiction? Will it facilitate an unfair advantage for your company or just get them on equal footing with the competition? A former Company A employee who worked on my team recently contacted me to request that I provide copies of some materials we worked on during his employment. 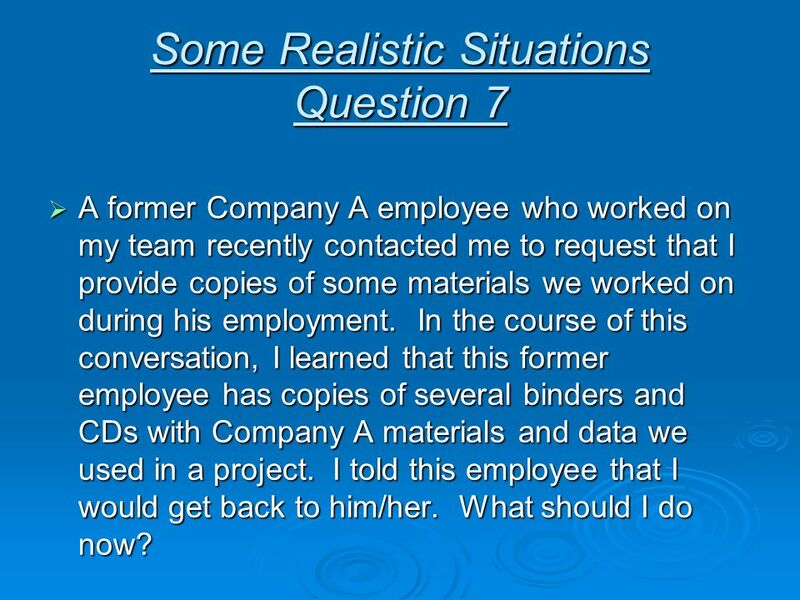 In the course of this conversation, I learned that this former employee has copies of several binders and CDs with Company A materials and data we used in a project. I told this employee that I would get back to him/her. What should I do now? If you told someone you will contact them, then you should follow your commitment. As far as the materials are concerned, you should ask if they are proprietary materials that belong to company A or intellectual property resulting from your work together. You should also be familiar with company A’s policy on intellectual property as to what is & is not transferable and pass along this information as appropriate to the former employee. 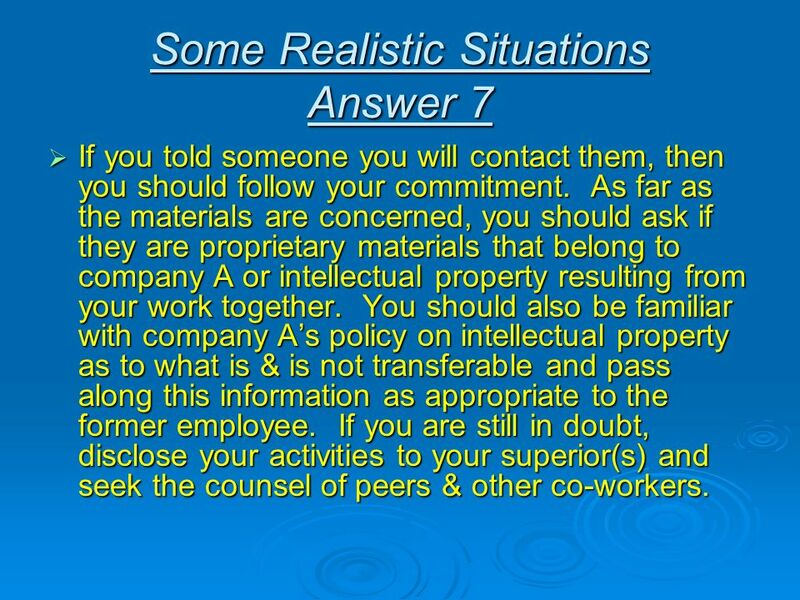 If you are still in doubt, disclose your activities to your superior(s) and seek the counsel of peers & other co-workers. 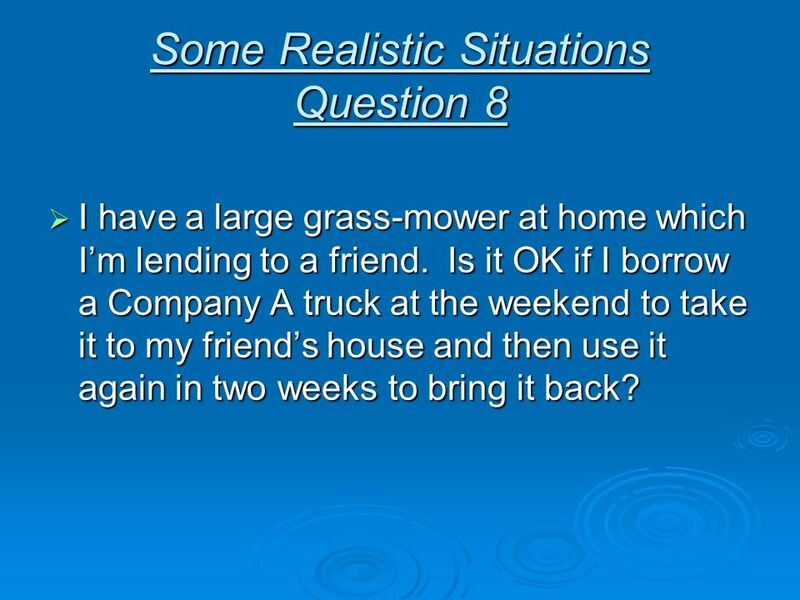 I have a large grass-mower at home which I’m lending to a friend. Is it OK if I borrow a Company A truck at the weekend to take it to my friend’s house and then use it again in two weeks to bring it back? Since this is a work truck, you should follow company A’s policies on the personal use of company vehicles. There are many liability issues to consider. 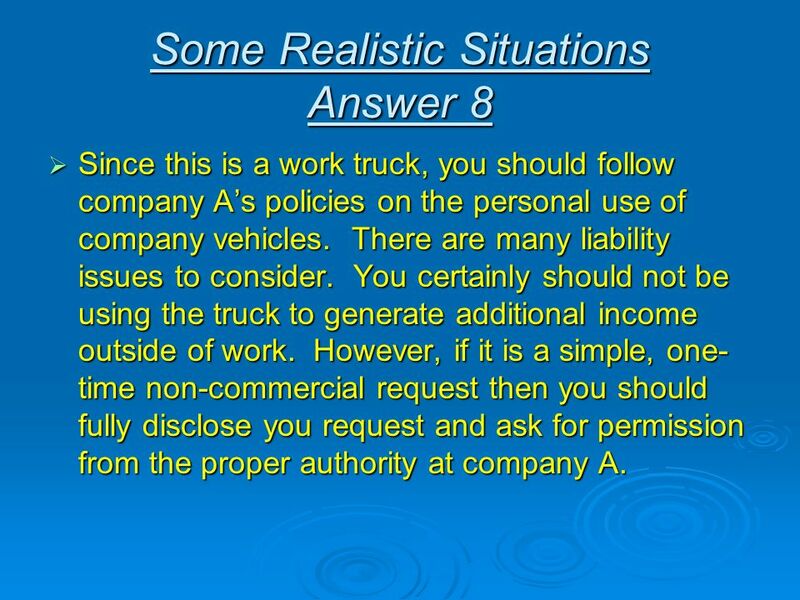 You certainly should not be using the truck to generate additional income outside of work. However, if it is a simple, one-time non-commercial request then you should fully disclose you request and ask for permission from the proper authority at company A.
I have just joined Company A as a new employee. My prior employer is one of Company A’s largest competitors. Can I share some important confidential marketing information that I developed while working for this competitor? You must follow your conscience as what is acceptable knowledge transfer. Your intellectual property is yours to keep and may be transferred. However, proprietary information that you know is confidential should not be shared with out permission. You also have potential legal implications if confidential information is shared, especially if you signed a confidentiality clause with your former employer. 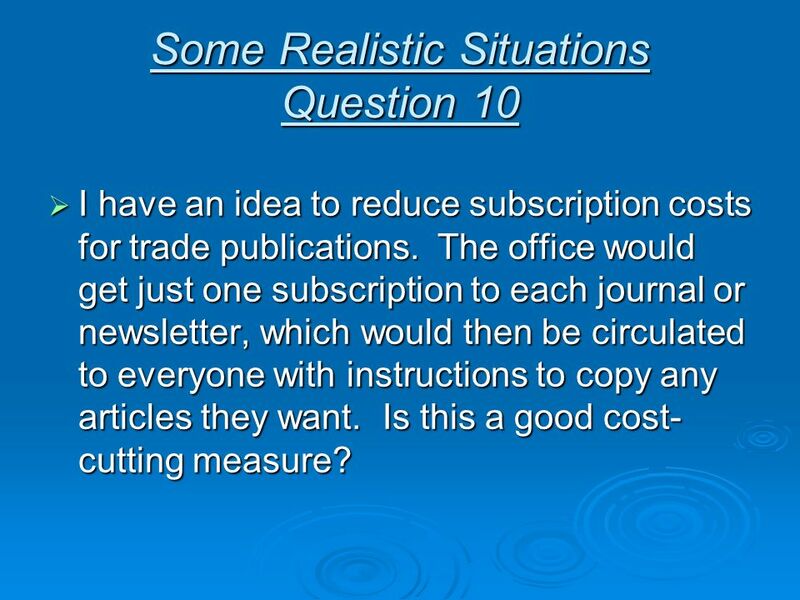 I have an idea to reduce subscription costs for trade publications. The office would get just one subscription to each journal or newsletter, which would then be circulated to everyone with instructions to copy any articles they want. Is this a good cost-cutting measure? Check each publication for their particular policy. 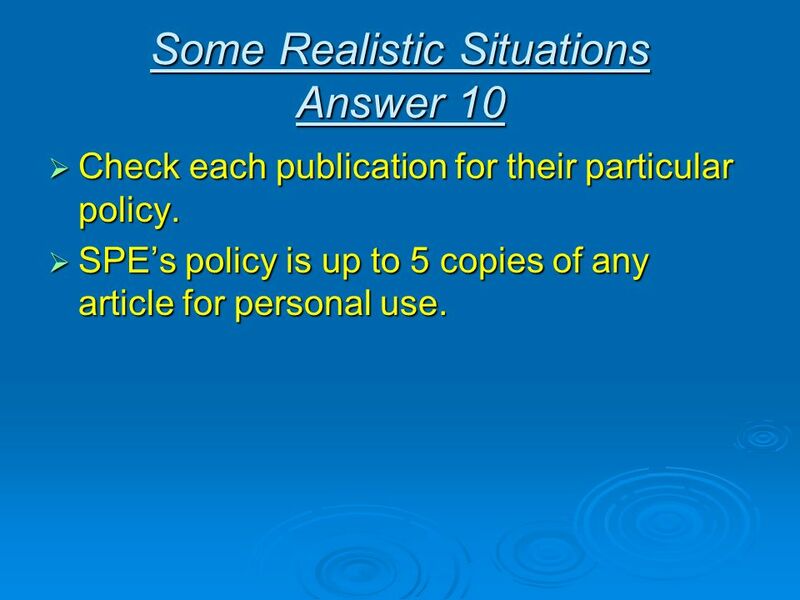 SPE’s policy is up to 5 copies of any article for personal use. 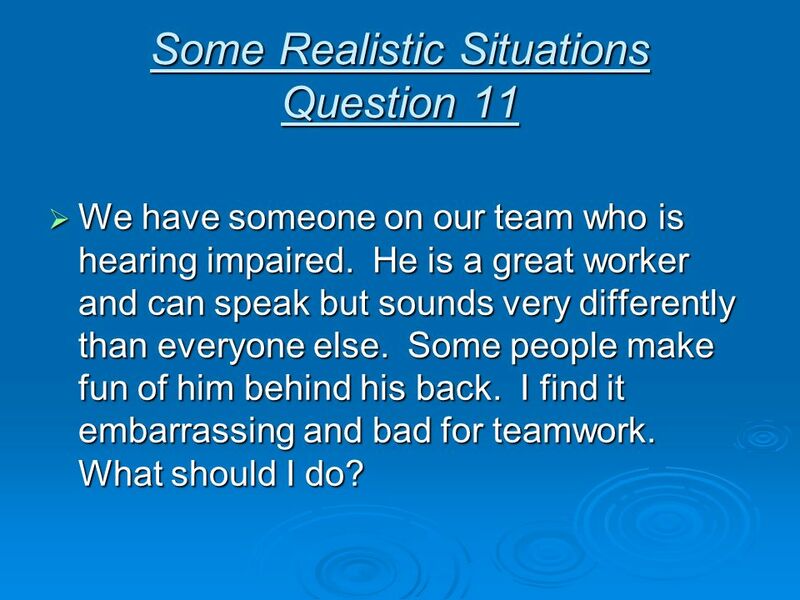 We have someone on our team who is hearing impaired. He is a great worker and can speak but sounds very differently than everyone else. Some people make fun of him behind his back. I find it embarrassing and bad for teamwork. What should I do? It is difficult, if not impossible, to control the behavior of co-workers at all times. Also, offensive behavior is relative and takes on many different meanings, especially in a multi-cultural work environment. However, if you find this mockery in bad taste and counter-productive to work, you should talk to the offending individual in private and tell them your feelings. If the problem persists, you should comply with your company’s code of conduct and report the offending behavior to a supervisor. Also, at some point, you should inform the hearing impaired individual and seek his assistance in ceasing the offensive behavior. I was working late last night at the office. When I went to use the photocopier I found a small stack of personnel records in the sorter. I noticed that the copies contained payroll information for our department. There was a lot of personal information on these forms. I didn’t want to get anybody in trouble, but I also didn’t think it was right that this kind of information was left for all to see. What should I do? Unfortunately this is a fairly common occurrence and there is great potential for identity theft and inappropriate communication of personal information. 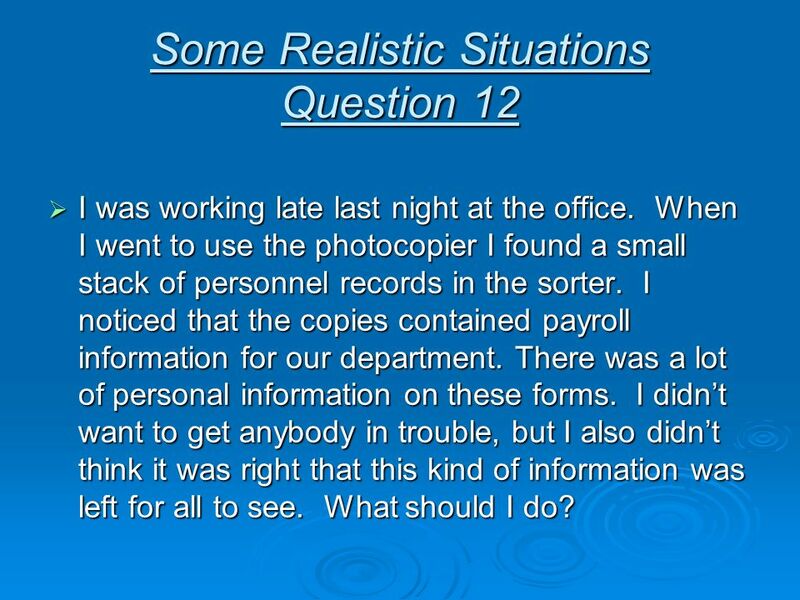 Put the personnel records in a safe place and immediately notify the responsible authority for this material. Disclose at the start of the next day of business and don’t read anymore of the confidential information while you are working late. 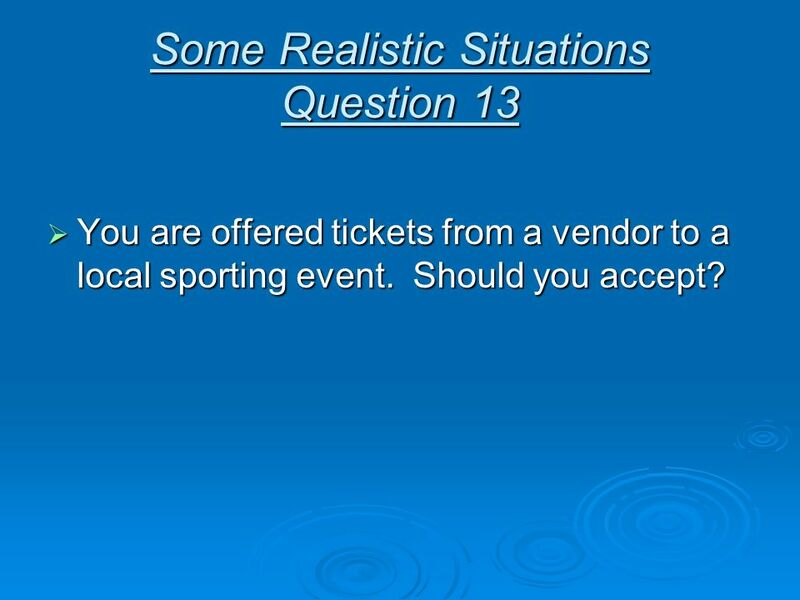 You are offered tickets from a vendor to a local sporting event. Should you accept? Accepting sporting tickets is a typical ethical dilemma that does not carry a one-size-fits-all answer. 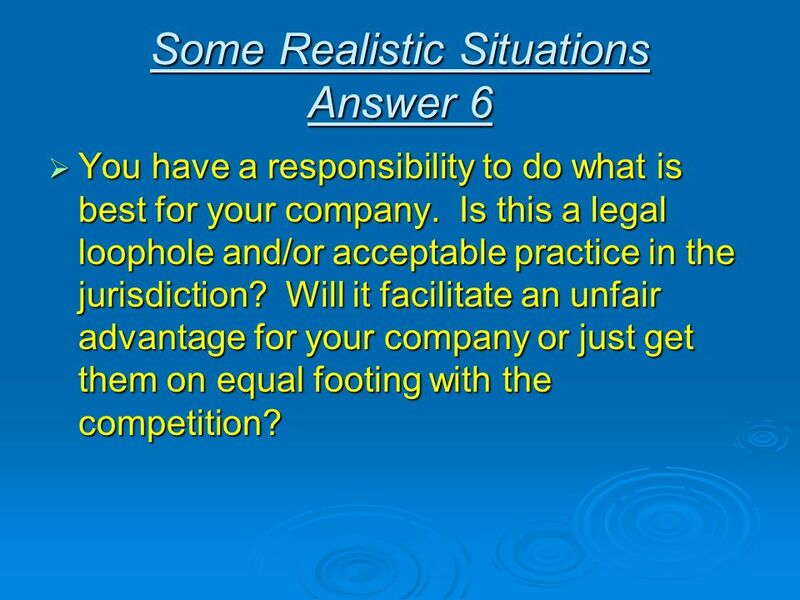 However, there are some guidelines that can be relevant to most situations: First, what are your company’s rules? Is this stated in your code of conduct? Most companies forbid “extravagant” gifts of any kind. It is also customary to avoid any “extra contact” with vendors during a contract tender period. Is the vendor giving you tickets from a “face value” purchase or are these a special, high-end purchase to a coveted event like the Super Bowl, World Cup, etc.? 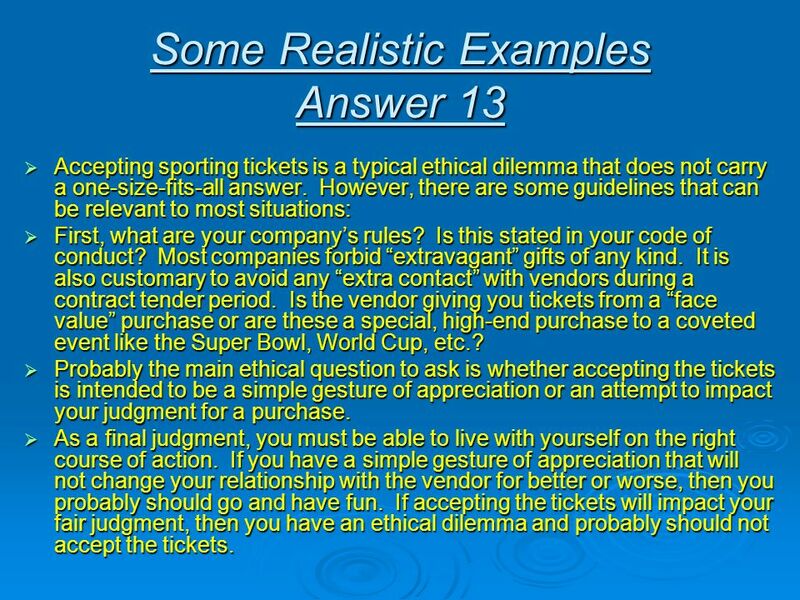 Probably the main ethical question to ask is whether accepting the tickets is intended to be a simple gesture of appreciation or an attempt to impact your judgment for a purchase. As a final judgment, you must be able to live with yourself on the right course of action. If you have a simple gesture of appreciation that will not change your relationship with the vendor for better or worse, then you probably should go and have fun. If accepting the tickets will impact your fair judgment, then you have an ethical dilemma and probably should not accept the tickets. A personal friend is a candidate for a job with your company and you will potentially be involved with the hiring decision. What should you do? You should not let your friendship affect a hiring decision with your company if it gives them an unfair advantage. However, if your friend is also a potential valuable resource to your company, it is equally unfair to “penalize” your friend in a hiring competition. It is always best to disclose your friendship to everyone in the hiring process and to volunteer to be excluded from sensitive hiring conversations. It is acceptable to share your friend’s qualifications and offer other outside references to assist in a fair hiring decision. Consider recruitment incentive. You work for an operating company and an old friend from college is now a senior manager with a service company. You are working in a very busy area and there is robust competition for your well services, including many competitive bids. What should you do? It is not ethical to give your friend an unfair advantage over his competitors. It is best to disclose your friendship to your supervisors. You should also have an agreement with your friend to not discuss sensitive issues and avoid private meetings during contract tenders. “Common sense” goes a long way on this judgment. Also, if it is a good friend, you should have better things to discuss in private than work. Follow your company’s guidelines for bidding procedures. Consider recusing yourself from the process. 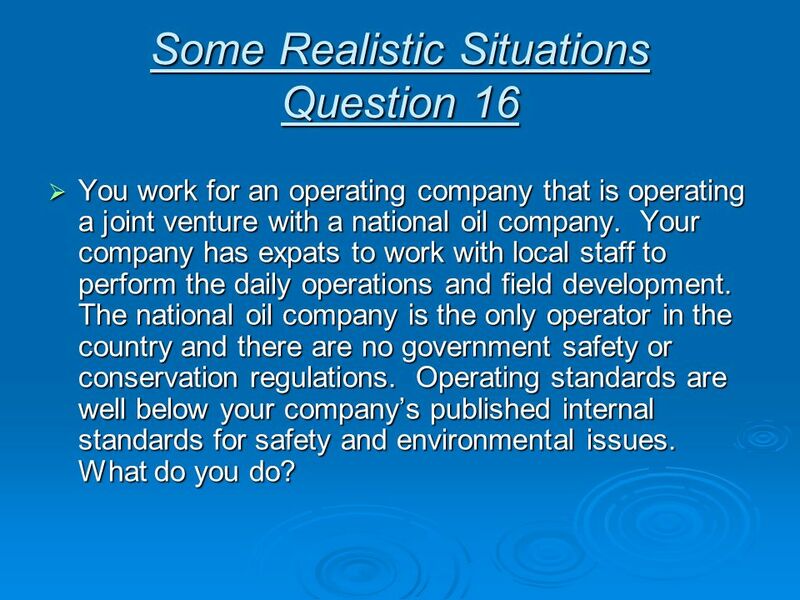 You work for an operating company that is operating a joint venture with a national oil company. Your company has expats to work with local staff to perform the daily operations and field development. The national oil company is the only operator in the country and there are no government safety or conservation regulations. Operating standards are well below your company’s published internal standards for safety and environmental issues. What do you do? This is a difficult issue where one must balance business issues versus acceptable tolerance of relaxed safety and environmental standards. No laws are being broken and the national oil company obviously holds itself to a different standard from the international company. 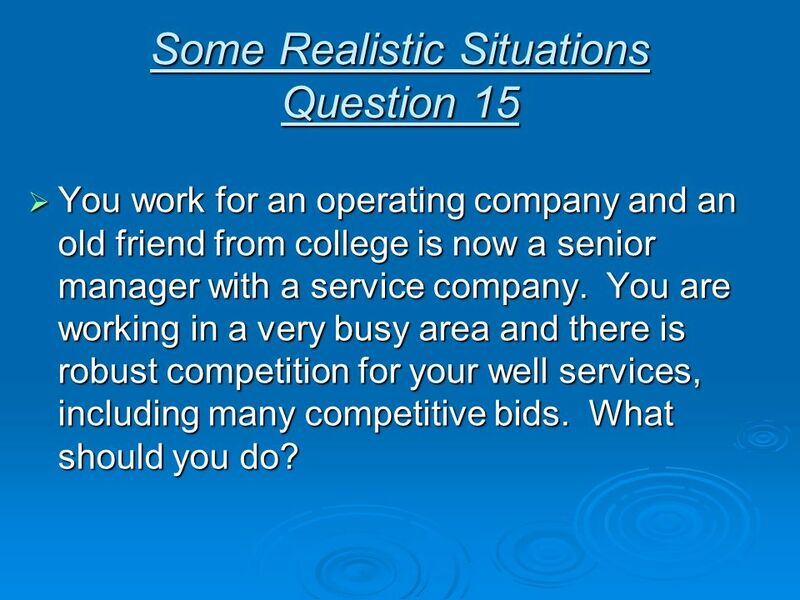 In this situation it is most often best to have a realistic view of your company’s influence on the operator. Do your best to achieve conformance with your preferred standard. You should ensure that there is full disclosure to your senior management of the operating issues. It is also good to have informal discussions with fellow expats on what will not be tolerated under any circumstances. You provide engineering services to clients in the fields of reservoir engineering and reserves analysis and reporting and are paid for your time and reasonable expenses. 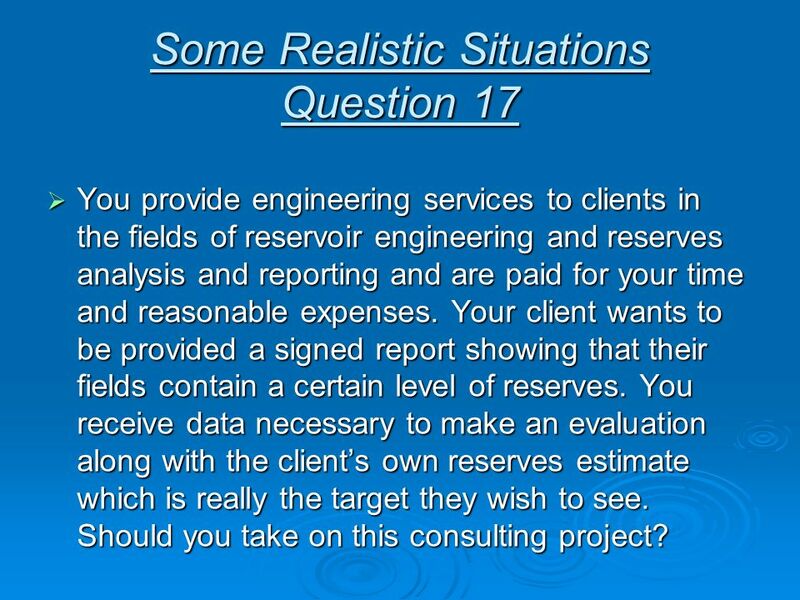 Your client wants to be provided a signed report showing that their fields contain a certain level of reserves. You receive data necessary to make an evaluation along with the client’s own reserves estimate which is really the target they wish to see. Should you take on this consulting project? 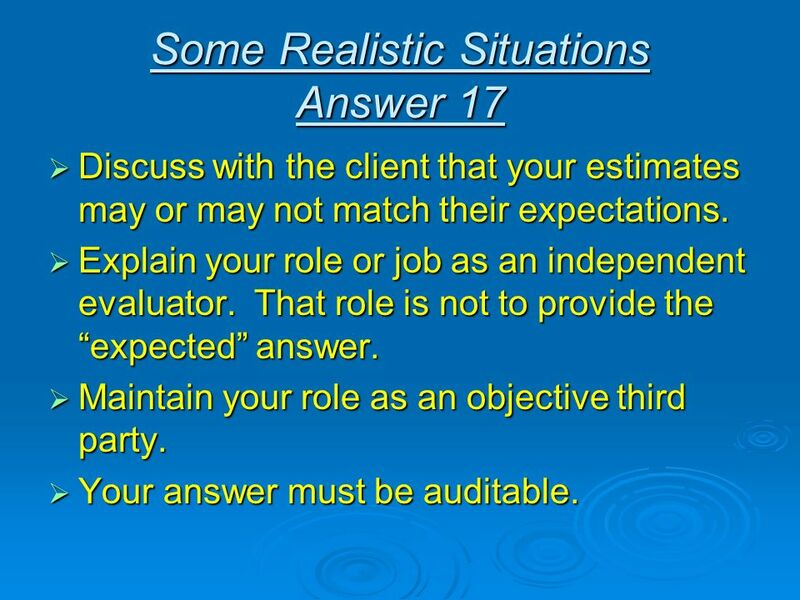 Discuss with the client that your estimates may or may not match their expectations. 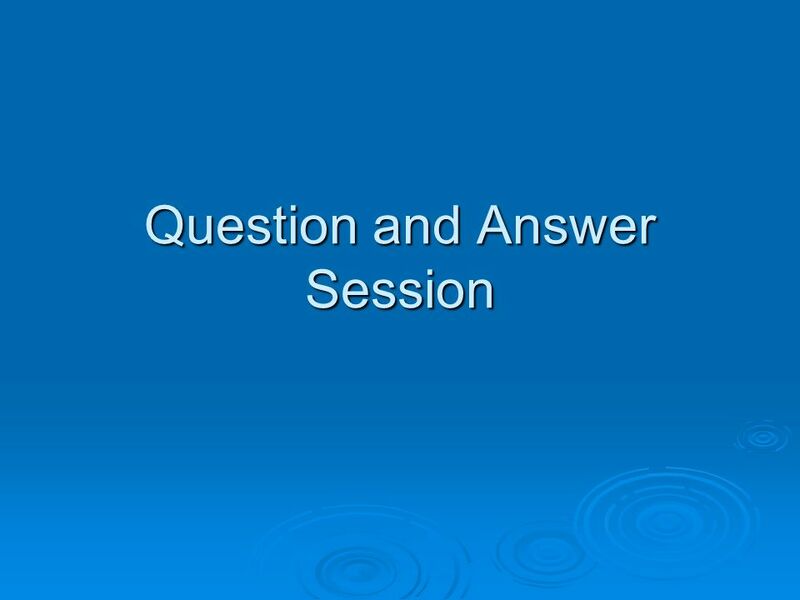 Explain your role or job as an independent evaluator. That role is not to provide the “expected” answer. Maintain your role as an objective third party. 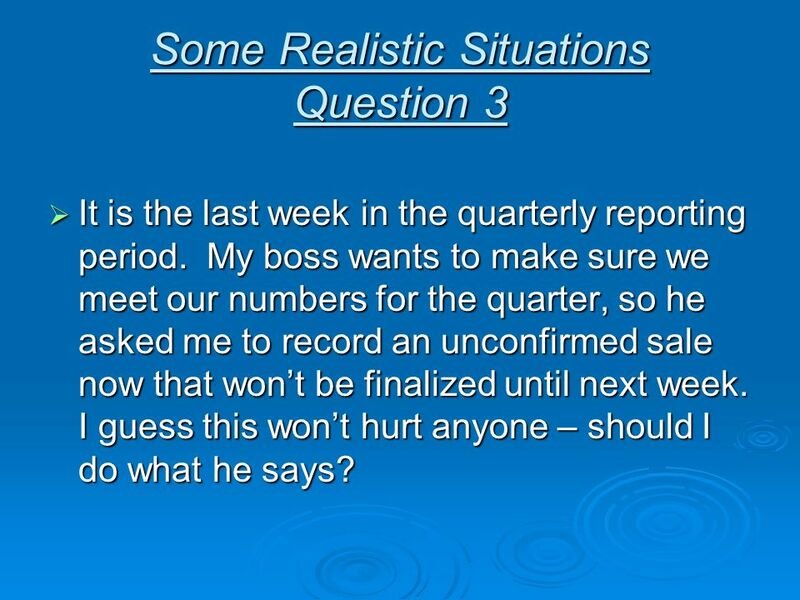 Your answer must be auditable. 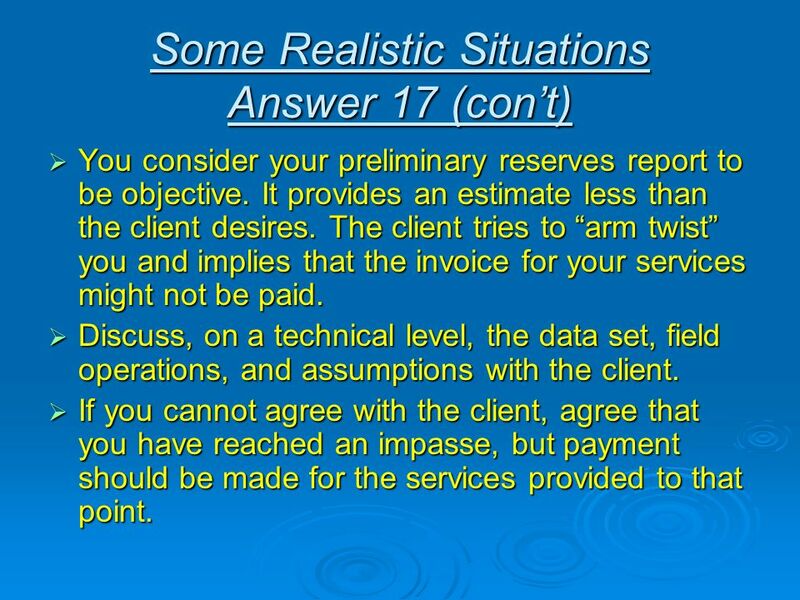 You consider your preliminary reserves report to be objective. It provides an estimate less than the client desires. The client tries to “arm twist” you and implies that the invoice for your services might not be paid. Discuss, on a technical level, the data set, field operations, and assumptions with the client. If you cannot agree with the client, agree that you have reached an impasse, but payment should be made for the services provided to that point. You consult as a petroleum engineer in the U.S. One recently completed client project concerns the evaluation of an oil field. Client “A” owned a large working interest. You spent considerable time analyzing the logs, well files, reservoir maps, volumetrics, drilling potential, etc. 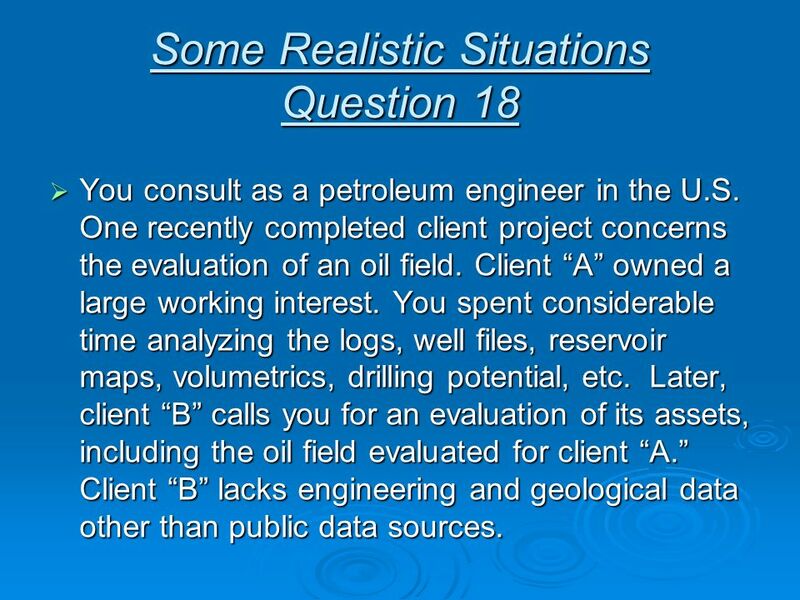 Later, client “B” calls you for an evaluation of its assets, including the oil field evaluated for client “A.” Client “B” lacks engineering and geological data other than public data sources. First, is it a conflict of interest and is it ethical to take on the assignment for client “B” since you earlier worked on the same field with client “A”? 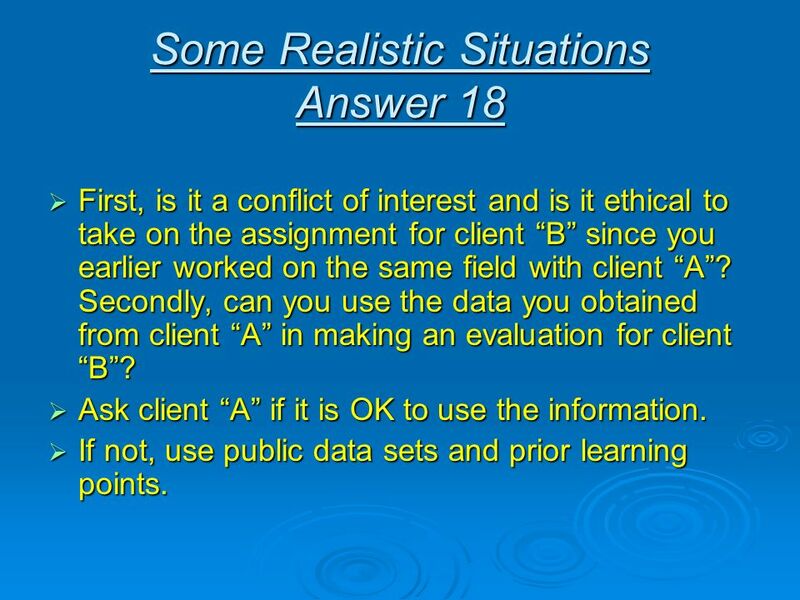 Secondly, can you use the data you obtained from client “A” in making an evaluation for client “B”? Ask client “A” if it is OK to use the information. If not, use public data sets and prior learning points. Your parent-based position is staff reservoir engineer at Company X. In the past year you have come into the offshore West Africa asset group. Your office handles most subsurface work, but the overseas office handles “hardware” issues including facilities/platform engineering, design, and project planning. 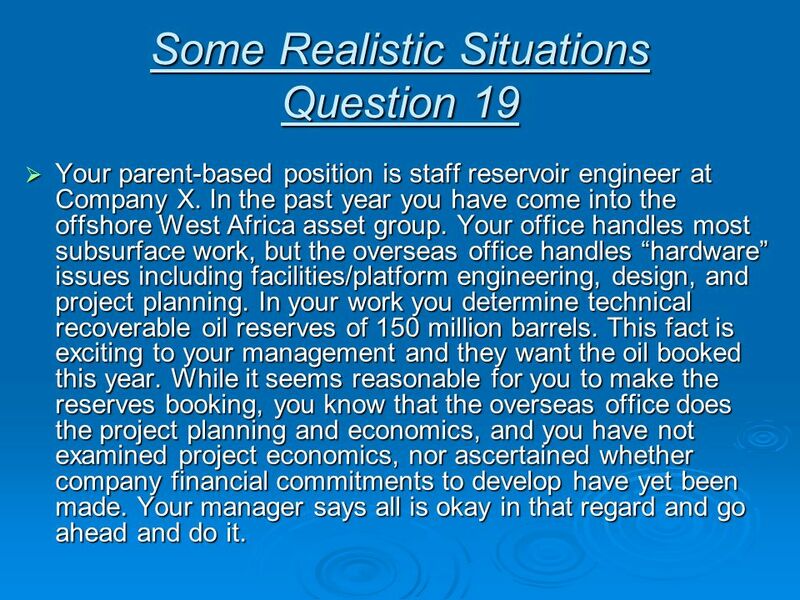 In your work you determine technical recoverable oil reserves of 150 million barrels. This fact is exciting to your management and they want the oil booked this year. While it seems reasonable for you to make the reserves booking, you know that the overseas office does the project planning and economics, and you have not examined project economics, nor ascertained whether company financial commitments to develop have yet been made. Your manager says all is okay in that regard and go ahead and do it. Can you book these reserves? 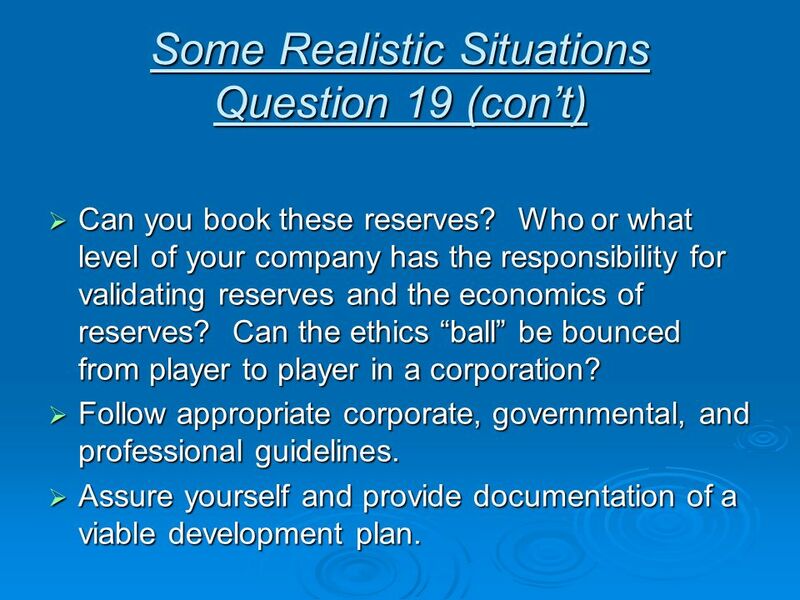 Who or what level of your company has the responsibility for validating reserves and the economics of reserves? Can the ethics “ball” be bounced from player to player in a corporation? Follow appropriate corporate, governmental, and professional guidelines. 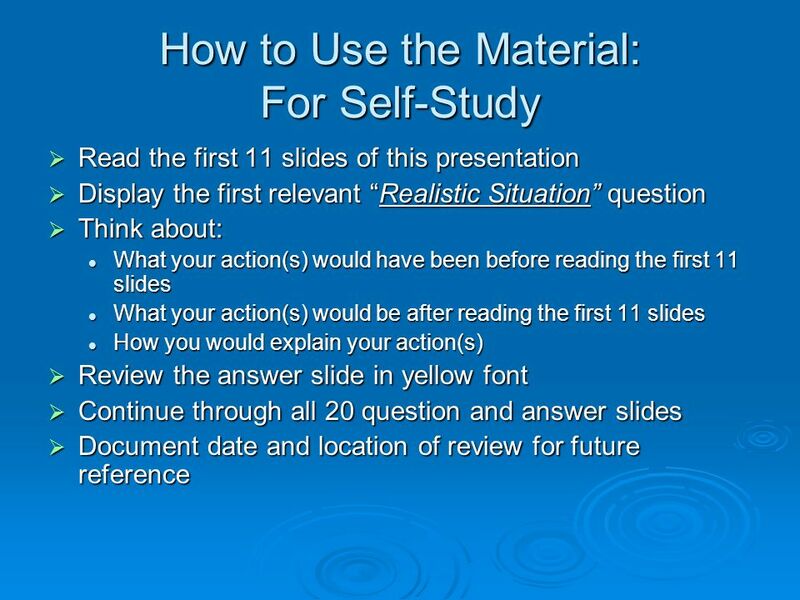 Assure yourself and provide documentation of a viable development plan. Follow appropriate corporate, governmental, and professional guidelines. Assure yourself and provide documentation of a viable development plan. You have been hired in mid-year as a division level manager of E&P assets in a major oil company. Of course the job is new for you; also, your staff is fairly thin in experience but at least there is some continuity in knowledge of the gas and oil fields. Your compensation package is salary plus bonus. Bonus is tied to “results:” exceeding production targets, reserves growth, and HS&E. The year has been good so far, but at the December meeting with your staff, covering reserves and production targets, you realize that there are problems. For one thing, the maps on which some major reserves have been booked are wildly optimistic. In fact, they show gas below lowest known gas. Also, production goals are based upon these interpretations. You would hate to have a lost time accident when your boss hurts you for blowing the reserves target and cutting the production goal for next year. 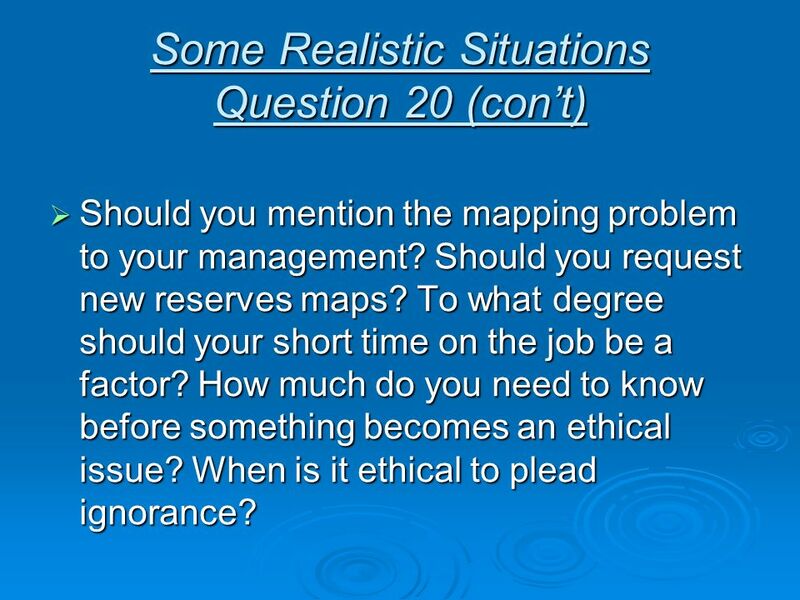 Should you mention the mapping problem to your management? Should you request new reserves maps? To what degree should your short time on the job be a factor? 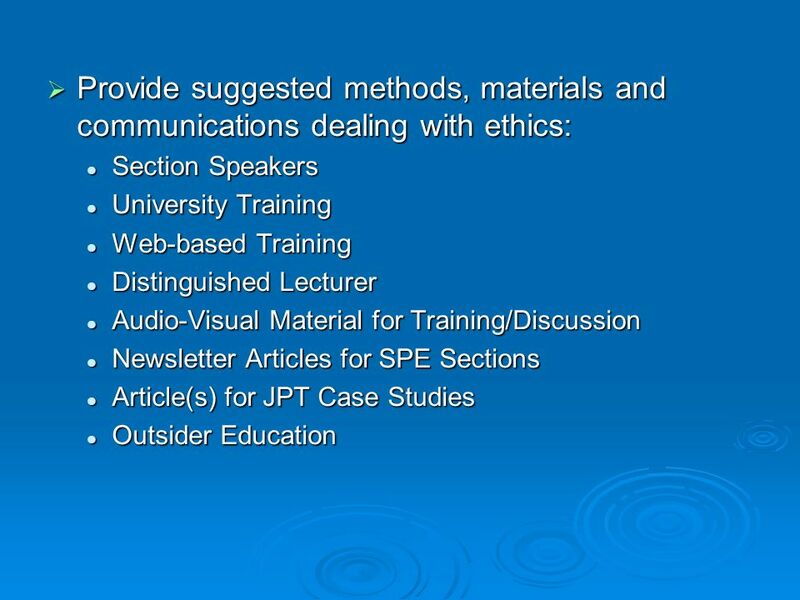 How much do you need to know before something becomes an ethical issue? When is it ethical to plead ignorance? 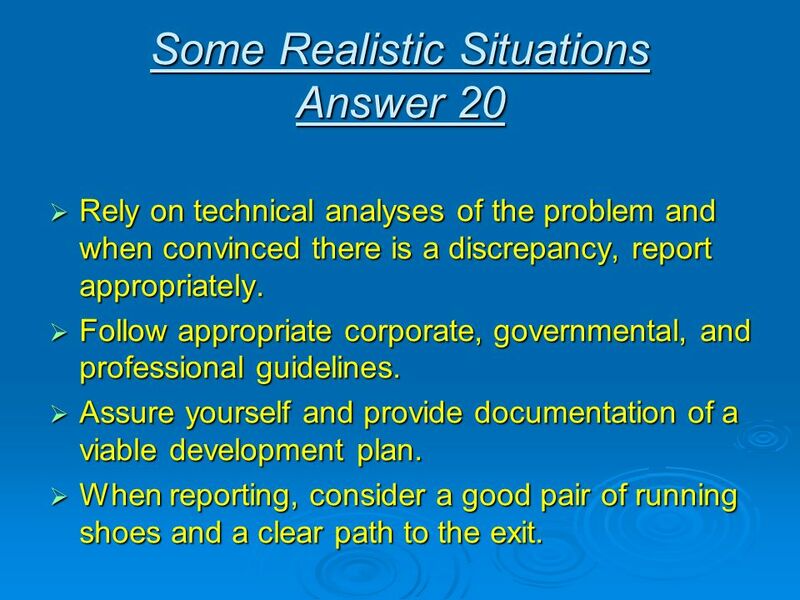 Rely on technical analyses of the problem and when convinced there is a discrepancy, report appropriately. Follow appropriate corporate, governmental, and professional guidelines. 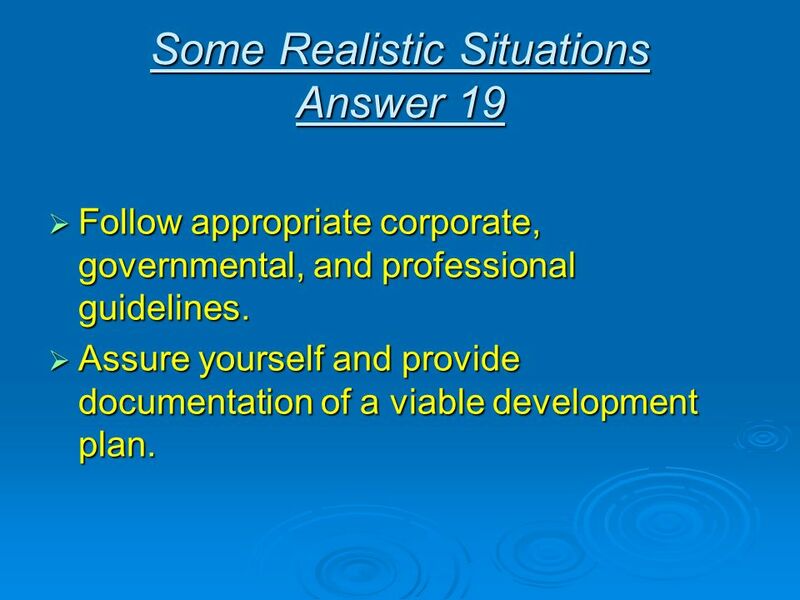 Assure yourself and provide documentation of a viable development plan. When reporting, consider a good pair of running shoes and a clear path to the exit. 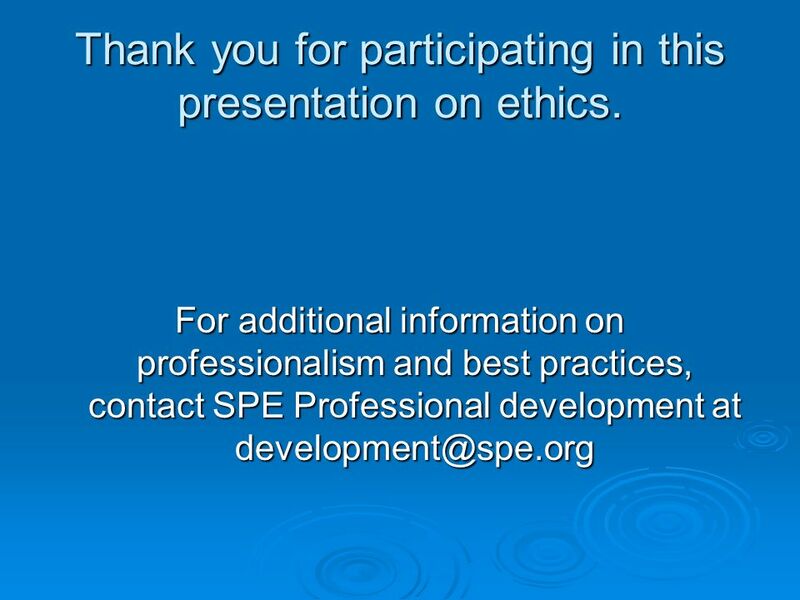 54 Thank you for participating in this presentation on ethics. 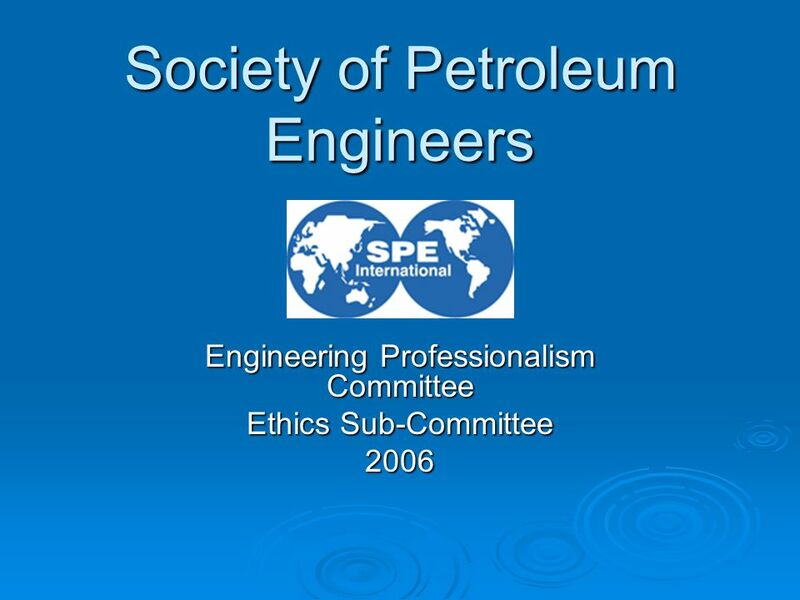 Download ppt "Society of Petroleum Engineers"
2 1.Client protection principles 2.Principle #6 in practice 3.The client perspective 4.Participant feedback 5.Tools for improving practice 6.Conclusion. Mark Radford, Partner, Colin Biggers & Paisley, Australia Conflicts of interest faced by reinsurance brokers and duties owed by producing and placing brokers. Not Friend Or Family Maintaining Effective Boundaries in the Helping Professions: Ethical & Practical Considerations Paula M. Taliaferro, MGS, LSW. Top 20 Things Your Advisor Didn’t Tell You! This list of advice was put together by AEG members reflecting on lessons learned during our first years working. 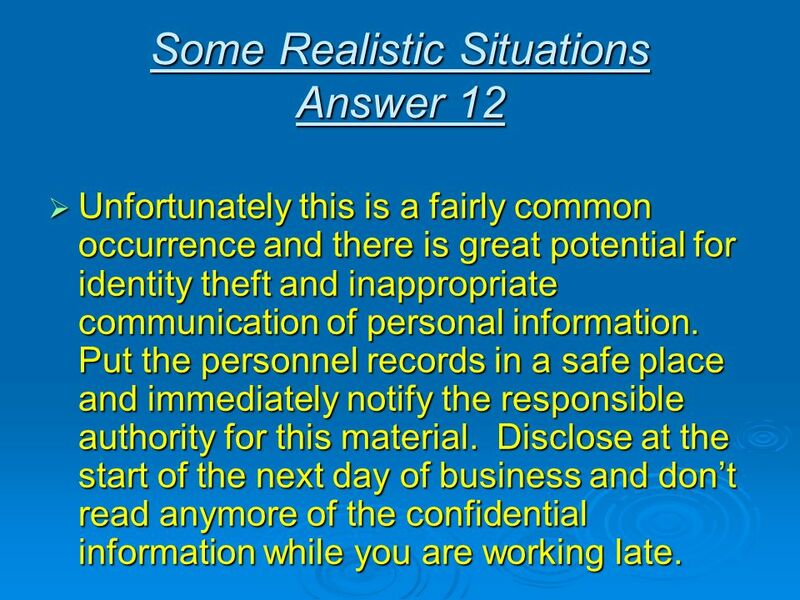 Company Confidential Registration Management Committee (RMC) Confidentiality & Conflict of Interest Palm Beach, Florida January 16, 2013 R. Darrell Taylor.